By now, even if they’ve never used one themselves, most people are pretty familiar with the idea behind gesture control systems such as the Kinect – the user makes a movement, the device “sees” that movement, and interprets it. However, what would happen if the user was in another room, blocked from the device’s cameras and depth sensors? Well, as long as there was a Wi-Fi signal available, it wouldn’t be a problem … at least, not if the WiSee system was being used. Created by a University of Washington team led by Prof. Shyam Gollakota, the technology utilizes nothing but the Wi-Fi signals already present in a room, such as those emitted by smartphones or laptops. Those signals travel through the interior walls of the building, and are monitored by a centrally-located WiSee receiver – although a regular Wi-Fi router could also be adapted for the same purpose. Should the user move even just a hand or a foot, they will cause a change in the frequency of the Wi-Fi signal, known as the Doppler frequency shift. 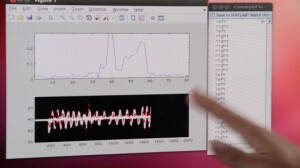 Even though that shift is typically only in the order of several hertz, an algorithm created by the researchers allows the receiver to detect it. The upshot is that a WiSee user could (for example) be sitting in the bathroom, and wave their arm in order to turn down the stereo in the living room … if the receiver had already been programmed to pair that gesture to that function. So far, the system has been tested in a two-bedroom apartment and an office setting, with five users. It was able to correctly identify 94 percent of the 900 gestures made by those people. 3D Printing – What does it mean for the future of design and manufacturing?